Somnath Chatterjee is suffering from kidney ailment and was re-admitted to the hospital on August 10 following slight decline in his health. Somnath Chatterjee had suffered a hemorrhagic stroke in July. 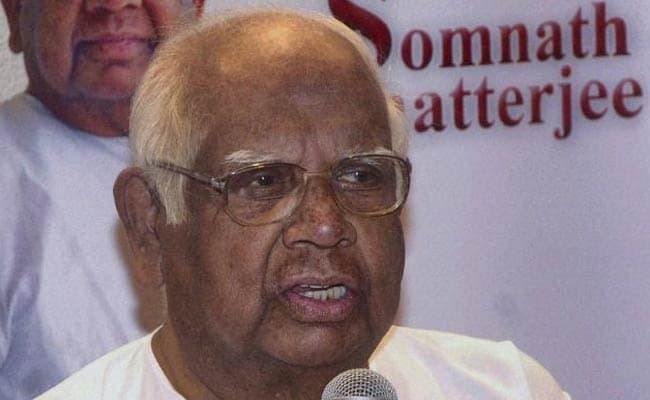 The health of former Lok Sabha Speaker, Somnath Chatterjee, continues to be in a critical state. The CPI(M) veteran is suffering from kidney ailment and was put on ventilator support on Saturday. The 89-year-old was re-admitted to hospital on August 10 following the slight decline in his health. Somnath Chatterjee, who is one of the longest-serving parliamentarians in India, has not been keeping well from the past few months. In July, he was admitted to a private medical centre in Kolkata after suffering a hemorrhagic stroke. Somnath Chatterjee a 10-time parliamentarian, is currently an independent lawmaker in the Lok Sabha. He served as the Speaker of Lok Sabha from 2004 to 2009. He joined the CPI(M) in 1968 and remained its leader till 2008. He was expelled from the party after he refused to step down from his position in the Parliament after the Communist party withdrew support from the Congress government over the India-US nuclear deal.